These easy salad recipes are not all "green" recipes. These recipes range from fresh fruit salad, homemade chicken salad, ham salad and tuna salad - to fresh green salad, potato salad, pasta salad, egg salad and much more. There is nothing better than a homemade chicken salad sandwich on a warm summer day; or any day for that matter. I offer tasty homemade salads that you can take to church gatherings, a family get together and football games. Make one or try them all - they are that good. I also LOVE a good ham salad sandwich with crunchy homemade bread and butter pickles. Delicious with this easy salad recipe. Mix all ingredients together and season with salt and pepper. Chill for at least 3 hours and serve on croissants, toast, muffins or biscuits. Delicious served alone with crackers too. Enjoy. This easy salad recipe was adapted from Ringel Ehlers of Madison, Wisconsin and was in the Wisconsin State Journal in 1988. For the salad: Marinate the pork in hoisin for at least 1 hour; turning occasionally. Roast on a rack over water for 20 minutes or until pink is gone, turning once after 10 minutes. Cool and slice very thin. Fill a medium salad bowl with the greens. Top with celery, onions and chestnuts. Just before serving, add the sliced pork, chow mein noodles and sesame seeds. For the dressing: Combine all ingredients and pour over salad. Serves 4 to 6. 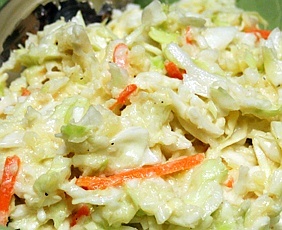 In a large bowl, combine the shredded cabbage, carrots, pineapple, mango and red onion. In a small bowl, mix the mayonnaise, apple cider vinegar, lime juice, sugar and 2 tablespoons of pineapple juice. Whisk together until smooth. Pour mayo mixture over the cabbage mixture and lightly toss to coat everything. Cover and chill in the refrigerator for 30 minutes and it's ready to serve.